Production continued of one-off cars for various clients, but the death of Roselli and the increasing availability of competitive sports cars saw the workload at Colli reducing. Notable in these years was the production of a successful powerboat, various BMW powered cars and some Formula 3 cars. In 1952 they became an official coachbuilder for Alfa Romeo and built various cars for them, including amongst others the 3000CM coupé and spider and a single variant of the 2000 Disco Volante. Generally, however, they turned more to specially equipped vehicles (than competition cars), mainly for the security forces. The 1900 ti was produced for the Police in both an armoured version with a Webasto sunroof and a four-door cabriolet, whilst a Fiat 1900 cabriolet was also built. Limousine versions were also built of both the Giulietta and the 1900, as well as a four seater 1900 Sprint which was displayed at motorshows in 1953. Finally they were responsible for producing a series of Giulia estate cars (the Promiscua) both for the police and for civil sales. During the 'Alfa' years, a few other cars continued to be built, including a small number of Panhard based cars which used a styling similar to the Disco Volante. 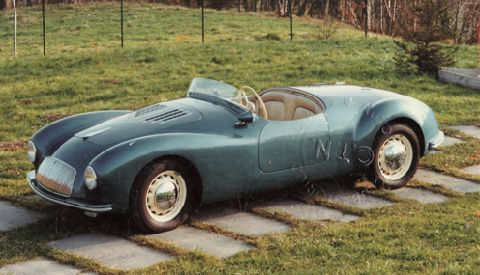 In 1955 they also constructed the shortlived Arzani-Volpini F1 car which used a twin-supercharged Maserati 1500 four-cylinder engine.